The album however, though it took me a while to get into, isn't a failure. Recorded only one year later than their debut, it does occasionally feel a little rushed but is a surprisingly solid record, garnering mostly favourable reviews at its time. Musically speaking it is rather similar to The Scream's innovative sound, but on Join Hands the group sounds much rawer - perhaps due to the hurried production. In a context like this the rawness is exactly what's needed, so it does feel like a suitable direction. The album opener "Poppy Day" reflects the cover art (statues of World War I soldiers) and is based on John McCrae's 1915 war poem "In Flanders Fields". It sounds like a post-punk military march. It is followed by "Regal Zone" which paints a picture of cruel and bloodthirsty medieval rulers: "Old limbs hang in the torture room / While old kings hang in the portrait room / Their noble eyes gaze on the uneasy dance / of the squirming body on the marble plate". Then it's one great song after another. "Placebo Effect" has a great, screechy guitar riff and clever lyrics that, as the title might suggest, deal with make-believe medication: "I must have faith in this procedure / It's a miracle / It's a wonder". Then comes "Icon", which in turn disses religion which lines such as "Close your eyes to your lies / Force feed more pious meat". 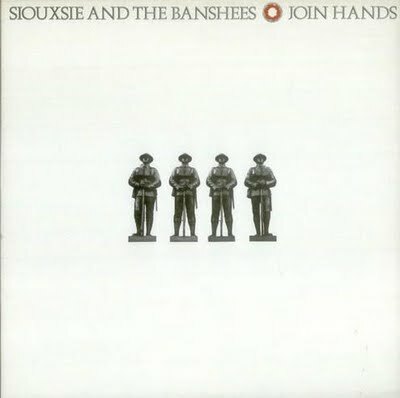 Siouxsie's tongue is a sharp sword, sweeping high and low. The song starts with a slower intro, then develops into a triumphant number driven by pounding drums. 'Gothic' is a rather controversial label, considering that many bands who've influenced the goth movement didn't really regard themselves as goths, but instead were inspired by the darkness and gloominess of say, gothic fiction. The bands who do see themselves as goths are often much more exaggerated and very different from their own idols. "Premature Burial" is an excellent example of the so-called proto-goth music, as it is a Edgar Allan Poe -influenced post-punk tune that opens with grim lyrics: "This catacomb compels me / Corroding and inert". Also this song assaults organised religion if I'm not mistaken: "The unchanged and unchangeable / Doing the zombierama / Singing 'Oh come and be like me / We're all sisters and brothers' / I'm not your sister or your brother / Don't bury me with this, this". The song is a really powerful dark anthem - and in that sense, one of their all-time best - that single-handedly stands as one of the albums strongest moments. It also namedrops the album title in it lyrics. It is then followed by the aggressive "Playground Twist", the only single released from the album. It plays with twisted nursery rhyme images and has an interesting 3/4 time signature. One of the biggest mistakes the Banshees ever made was the inclusion of "The Lord's Prayer" on Join Hands. "The Lord's Prayer" was originally a 20-minute improvised performance art piece that marked the band's debut in The 100 Club Punk Festival in 1976. Now, in 1979, three years and two different bandmates later they tried to recreate it's wackiness but it doesn't really work as it should. Which is sad, as "The Lord's Prayer" is the last impression the Join Hands leaves while feeling completely out of place on the otherwise great album. Thank god they did shorten it into 14 minutes, even though even that is too much. It ends up sounding messy and repetitive, and the only good part is the 30-second segment starting at 7:20. But then again, nothing stops you from simply skipping it. All in all, while the Banshees' destruction wasn't far during this time, the album turned out to be quite solid indeed. It perfectly showcases the raw moodiness that was very characteristic to early Banshees material, and whereas on The Scream it was "Switch" where the band's artistic ambition truly manifests itself, here it's "Premature Burial", one of their darkest moments of all time. The lyrics are brilliant and merciless, and Siouxsie's voice sounds just like it sounded on The Scream: her vocals are cold, sharp and commanding. Just like how you'd expect an Ice Queen (which is how the music press described her during the beginning of her career) to sound like. Try at least: "Placebo Effect", "Premature Burial", "Playground Twist"